As the holiday shopping season commences, ToyQuest today announced that the toy authority, Toys “R” Us, has named Blue Man Group Percussion Tubes among the “Fabulous 15” best new toys of 2006. The unique design of the Blue Man Group inspired Percussion Tubes and its ability to fuse multiple technologies with musical interaction attracted the attention of Toys “R” Us, while the company’s toy authorities complied its “Fabulous 15” list from its assortment of 36 Hot Holiday Toys for 2006. 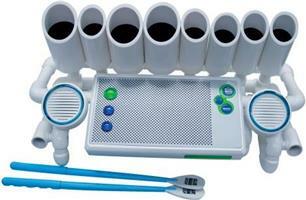 The Percussion Tubes is one of two Blue Man Group musical instruments launched nationwide this summer. Both instruments, the Keyboard Experience and Percussion Tubes feature proximity sensor technology, which allow kids to mix and layer music with a simple wave of their hands, pre-programmed songs, interchangeable instrument sounds, and iPod or MP3 compatibility. Prices vary from $69.99 to $89.99 and target children ages eight and older.